On Easter Day, the Easter bunny leaves a wonder Basket in front of your door. These Easter baskets full of candy such as chocolate bunnies, chocolate eggs, jelly beans, and many other fun candies. The basket is usually filled with colorful fake grass and the basket is usually very festive and colorful. The Easter bunny does a great job designing your basket just perfectly. Easter is almost as exciting for Christian children as Christmas is. You never know what type of candy you are going to get or what treats will be inside the plastic eggs that are within your basket. It is the kind of fun that only comes once a year. Below you will find some Easter basket themed crafts, I hope you enjoy them. To make a really cool paper Easter Basket....you only have to do a little bit of work. First of all, print out a black and white diagram or print out a color diagram. If you have card stock, this is the best material to print out your Easter Basket. You can just fold it as paper, but if you want it sturdier, and you only have paper, you can paste it onto cereal box cardboard before you fold it up. All you will need to do is cut out the diagram, fold it and glue it together. Then staple on a paper handle. Start off thsi craft with a square piece of paper or card stock, whether that means an 8 x 8 inches or 12 x 12 inches piece of paper...either way. Firstly, fold the paper in half, like in illustration 153. Then fold again, this time in to fourths, as seen in figure 154. ...and then fold in halfs again so that it is in eighths as seen in illustration 15Now you will see that there are dotted lines in this illustration....that is where you need to cut. Now draw the curved line and 1" from the rim of the paper that you just cut...as you see in illustration 156. Draw a curved line about one inch from outer edge as shown in Fig. 156. Now cut from the fold down to this line that you just drew. Now unfold the paper and it will look like figure 157. Now fold in the paper as you see in the picture. Now glue or psate the edges of the paper together to look like the picture in figure 158. Cut a handle and paste it or staple it to the inside of the basket. This will make a beautiful Easter Basket. Find a nice and large piece of paper or go out and buy a large piece of card stock or a large colored piece of paper. Here is an 8.5x11 template and here is an 11x14 template....it is only half of the template...because both sides are the same. So you can print out the template on printer paper and then cut this out. Then fold the bigger piece of paper in half...then trace it on the fold. Now cut it out. If you want it larger...use a big bowl to trace the circle. Then just make a square with rounded corners for the handles. Make decorations on the basket. Fold on the dotted lines. Do you want to make a very easy paper Easter basket? It is very easy to do. Get a square piece of paper. Fold it into 9 equal squares as seen in picture 1. You can just keep folding the paper over and over until you see 9 equal squares. Then cut on the red dotted lines....on either side of the middle top and middle bottom square. Then fold on the solid inner lines as you seen in the secon picture above. 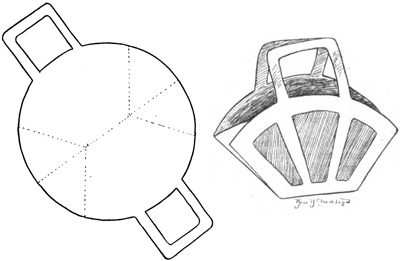 Then look at the 3rd illustration above to see how you glue the basket together. Just cut out a thin strip of paper and glue or staple the basket handle on the Easter Basket. You don't have to go out and buy expensive Easter Baskets for all of your friends and family members. Instead making handmade paper baskets to give some of your favorite people a treat on Easter day. All you need to do is follow the paper diagrams above. Follow the directions...such as on the box A. Get a square piece of paper. Use a ruler to make a grid of equal sized squares (16 squares). Cut on one line in each corner (it is marked. Fold that box inwards and glue it together. Do 2 of these...one slightly bigger, for the lid. Follow the directions on the 2 baskets lettered 'B' and 'C'. To make a four sectioned flower basket, find a sheet of firm paper at least 9 inches square and of the color that will be right for your flowers. 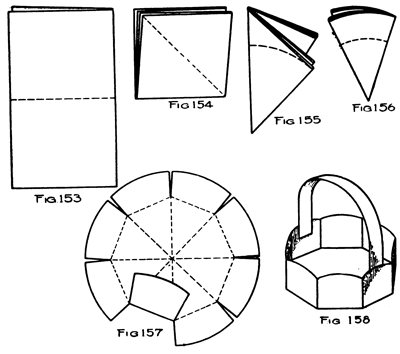 Fold the paper diagonally to find the center as in figure 1, pictured above. Open the paper back up. Now fold each corner to the center, as pictured in figure 2. 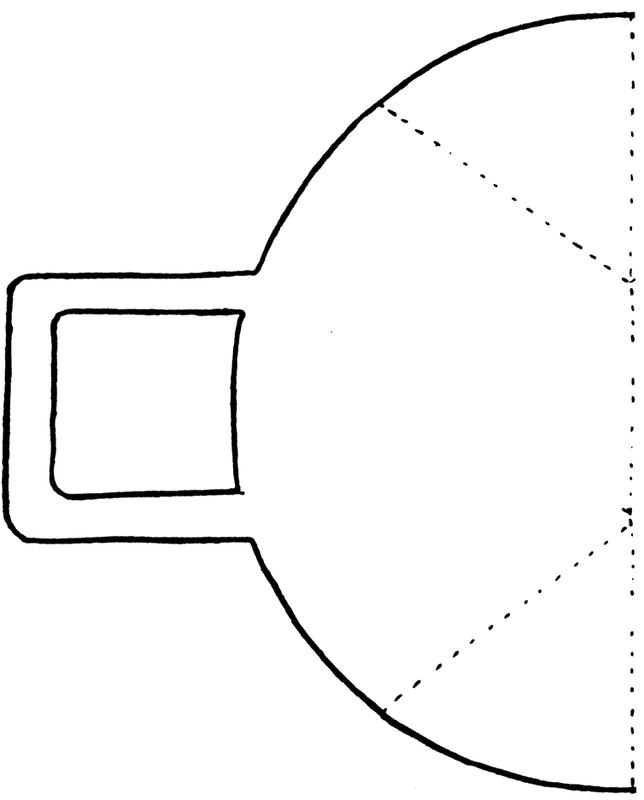 Turn the paper completely over and fold the corners of this side to the center, as seen in figure 3. Then fold the new square into a small square, as pictured in figure 4. 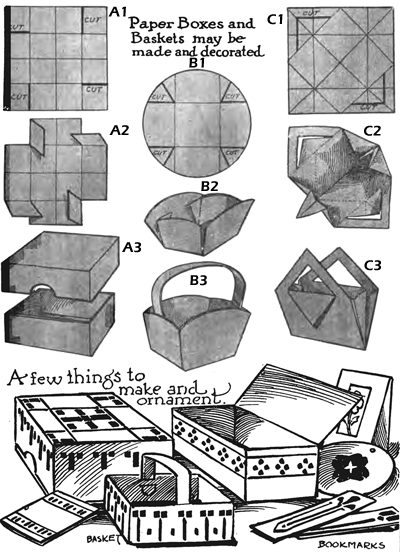 Now that this is done, unfold back to the last square, as pictured in figure 5. Now open the loose corners. Punch a hole at the center folds. Run a ribbon through this hole. Optionally, you can tie loose ends into a bow. 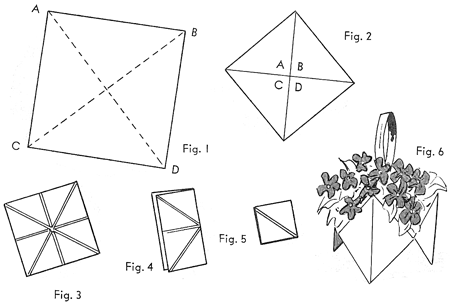 Fill each section with tiny flowers, as pictured in figure 6. Handprint Easter Basket Craft Idea for Kids - Here you will find an adorable Easter craft idea for your kids. Not only is it super fun to create, but it will also become an Easter Keepsake. Your children will use their own handprints to make an Easter Basket. Woven Paper Easter Baskets - Learn how to make these classic looking Easter Baskets by using a paper weaving technique. String / Yarn Easter Baskets - This turns out looking so cool - it is a glued yarn basket that hardens and sets to look really cool. Paper Folded May Baskets - This is a great craft for little ones. These May / Easter baskets are made out of paper. Easter Baskets with Berry Container - If you like strawberries, blueberries, raspberries, and other berries than you probably have a lot of extra baskets hanging around. Why not make mini Easter baskets for your friends with them. Make Easter Basket with Flower Petals Paper Folding Craft - This Easter basket is meant to look like it is made out of flower petals. We have provided a printable paper folding template that you can print out, and then fold up, paste, and make a handle to finish it up. It is pretty and can be used as a decorative table piece or to place flowers or candy in. This is a great craft for boys or girls to celebrate Easter, as well as the April and May season. Easter Handled Baskets with Berry Containers - Use a berry container as the base of a decorative basket...using ribbons weaved in and out of the slots to pretty it up. Easter Bunny Bag of Candy and Treats - Transform a simple brown bag into an Easter treat bag that looks like a bunny rabbit...find out how. Make Easter Counting Game Craft Activities for Preschoolers & Young Kids - Here’s a fun game to learn counting this Easter. This craft can also be done as a group activity, every child makes one basket and in the end the kids can play a game of putting the right number of Easter bunnies in each basket. Bunny Easter Basket Arts & Crafts Project for Children - All you need is some paper and glue to make this fun basket. Makes a great centerpiece for Easter Dinner. Bunny Easter Basket Craft - Learn how to make an adorable Easter bunny basket that is shaped like a bunny. Bunny Easter Basket Craft Activity Idea for Children - This is the perfect Easter basket for your Easter egg hunt. Bunny Egg Holders Crafts - Find out how to make a bunny egg holder from a cardboard tube, Easter eggs and other materials. 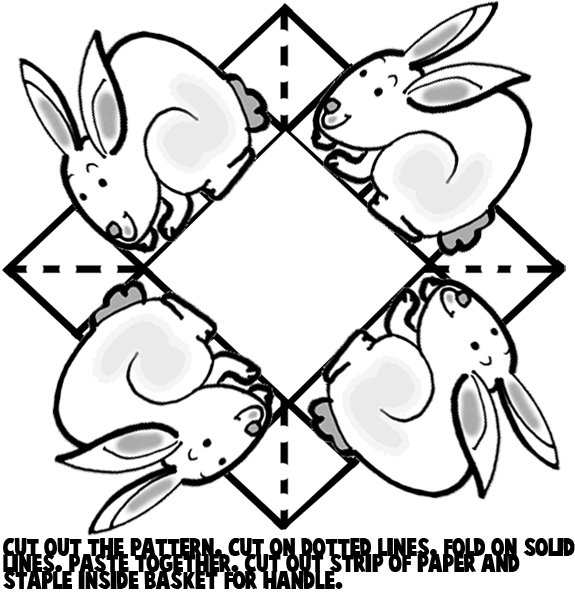 Bunny Envelope Easter Crafts - Follow these instructions to create a simple bunny envelope for Easter. Can Basket Easter - Find out how to make this beautiful can basket for Easter. Chicks in a Basket - Follow these instructions to create an Easter basket centerpiece full of chicks. Cone Shaped Carrot Easter Basket - Use the free templates to make different types of cone shaped Easter baskets. Cotton Ball Lamb Easter Basket Arts and Crafts Project Ideas - Make a Lamb Easter basket from a recycled empty container, cotton balls, white craft foam and other materials. Craft Easter Egg Holder - Make an Easter egg holder from a paper towel card board tubes, craft paper, stickers, glue stick and a paper crimper. Decorated Easter Basket Crafts Idea - Find out how you can turn an ordinary basket unto an adorable Easter basket. Easter Basket 3D Paper Model Crafts - This is a simple and fun Easter craft for preschoolers and kindergarteners. Easter Basket Centerpiece - Make an Easter Basket Centerpeice with your child. Easter Basket Favors Crafts Activity - Martha Stewart shows you how to make festive favors for Easter. Easter Basket Making Arts & Crafts Idea - Learn how to make a beautiful Easter basket using long strips of cotton cloth and a few other supplies. Easter Basket SWAPs Crafts Project for Girls - This is a great SWAP craft girls can make for the Easter holidays. Easter Basket Toddler Craft for Preschoolers - Children can make their own Easter basket from construction paper, child safe scissors, glue or tape, crayons, Easter grass, and a small food box. Easter Bunny Bag Arts & Crafts - Make an adorable bunny bag to store all your Easter candy. Easter Bunny Bag Craft - Make a Bunny Bag for Easter using a small pink paper bag, white poms, white chenille stems, wiggle eyes and small treats and candy to put in the bag. Easter Bunny Basket Arts & Crafts - Find out how you can turn a soup can into an Easter bunny basket. Easter Bunny Basket Arts & Crafts Activity Idea - Learn how to make this bunny shaped Easter basket. Easter Bunny Basket Arts & Crafts Project for Kids - Learn how to make a cute Easter bunny basket from an empty half gallon cylindrical ice cream container. Easter Bunny Basket Crafts Activity - Learn how to make this Easter Bunny Easter Basket. Easter Bunny Cotton Ball Basket Arts & Crafts Project - Learn how to make an Easter Bunny Basket from a basket, cotton balls, glue, felt, googly eyes and pipe cleaners. Easter Bunny Jelly Bean Bag Craft Activity - This makes a great Easter gift for all your friends. Easter Bunny Milk Carton Container - You can use this Easter Bunny container to keep your Easter eggs safe. Easter Centerpiece - Learn how to make a beautiful centerpiece for your Easter Sunday brunch or dinner. Easter Chick Bag Craft - Learn how to make a cute Easter chick bag from a paper lunch bag and other craft supplies. Easter Egg Holder Craft Idea - Find out how to make a Easter egg holder by following these instructions. Easter Favor Boxes - Follow these instructions to make amazing Easter favor boxes. Easter Jelly Bean Chick Crafts - Find out how you can turn a plastic Easter egg into a Jelly Bean Chick. Easy Easter Basket Craft for Kids with Recycled Items - This is a quick and simple Easter craft for children of all ages. Easy Easter Basket Crafts Ideas from Kaboose - Turn a strawberry basket into a cute Easter basket. Easy Easter Baskets Craft Ideas - This is a fun Easter activity for children. Edible Bird's Nest Crafts - Make a bird’s nest from chow mien noodles, chocolate chips, chocolate, jelly beans, candy coated chocolate eggs, marshmallow chicks, peanut butter, paper plate and wax paper. Edible Easter Basket Crafts Idea - Learn how to make an edible Easter basket from waffle style sundae bowls, red licorice, jelly beans, melted chocolate and coconut tinted with green food coloring. Edible Easter Basket Cut Arts and Crafts Activity - Learn how to make an edible Easter basket from softened vanilla, vanilla cookie crumbs, green tinted coconut and jelly beans. Egg Carton Easter Bunny Container - Make a Easter Bunny Container from an egg carton, Easter grass, cotton ball, paper, child safe scissors, a stapler and other craft supplies. Eggshell Easter Baskets Arts & Crafts Idea - A cool project that makes a basket that looks like an egg shell. Flower Basket Arts & Crafts Idea for Children - Learn how to make a flower basket for Easter. Flower Pot Bunny Easter - Turn a small flower pot into an Easter bunny in a few steps. Free Easter Basket Paper Craft Project - Follow these instructions to create a beautiful Easter basket from paper. Funny Bunny Craft Idea - Find out how you can turn a baby food jar into a funny bunny craft. Grassy Basket Crafts Idea for Easter - Learn how to make a cute Easter grass basket by following these instructions. How to Craft a Paper Origami Easter Basket - Learn how to fold paper into a paper easter basket, using origami techniques. How to Make a Paper Easter Basket - Follow these instructions to make an Easter basket from paper and other inexpensive supplies. How to Make Your Own Easter Baskets - This tutorial shows kids how to make their own Easter basket to store all their Easter eggs. Jelly Bean Basket Crafts Activity Idea for Easter - Make a jelly bean Easter basket from a toilet paper roll, construction paper, chenille stem, cellophane tape, scissors and a hole puncher. Kids Easter Egg Bag Craft - This is a quick and easy Easter egg bag children can make. Make This Fun Easter Basket - Make an inexpensive Easter basket from a paper plate, construction paper, chenille stem, pom-poms, crayons, stapler, and scissors. Milk Jug Easter Basket : A great Easter - Find out how to make an Easter basket from a milk jug. Miniature Easter Basket - Make a cute miniature Easter basket from a Styrofoam bowl, chenille stems, thin white ribbon, pink acrylic paint, Easter grass and Easter eggs. Mini-Easter Baskets - Learn how to make miniature Easter baskets from cardboard egg cartons. Mini Easter Baskets Crafts Activity - Follow these instructions to create cute miniature Easter baskets. These would make great Easter place cards. Mini Easter Bunny Baskets Craft - These little Easter favors delight both children and adults alike. They are great for Easter party favors as well as egg hunts. Origami Box for Mini Easter Eggs - Find out how you can fold a box from paper using the origami method. Paper Bag Bunny Craft for Children - Learn how to create a paper bunny with this arts and crafts project for kids. 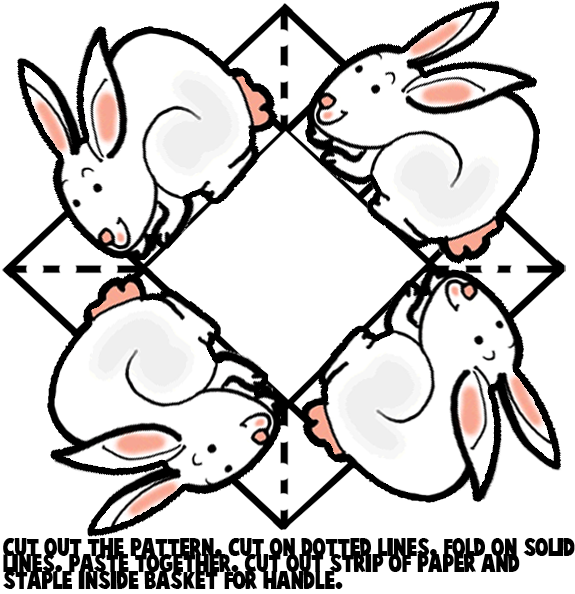 Paper Bunny Basket - This is a paper craft to make a bunny rabbit craft for kids. Paper Easter Bunny Basekt Crafts Activity - A simple bunny basket craft children can make for their Easter hunt. Paper Mache Easter Basket Craft Activity - Make this basket to hold your easter goodies. Paper Plate Easter Baskets Arts and Crafts Ideas - Follow these instructions to make Easter baskets from paper plates. Personalized Easter Basket to Make - Make a simple personalized Easter basket from an empty milk carton. Plastic Pop Bottle Easter Basket - Find out how to turn an empty two liter plastic soda bottle into a Easter Basket. Pretty Easter Basket Crafts - This is a simple Easter basket children can make from a recycled whipped cream container. Quick Easter Baskets - This makes a great Easter activity for the whole family. Recycled Milk-Jug Easter Basket Craft - Learn how to make an Easter Bunny Basket from a recycled milk jug. Soda Bottle Easter Basket : Craft an Easter Basket from a Soda Bottle - This is a great way for children to recycle during the Easter holiday. Spring Chick Surprise Craft - Find out how to make this cute Easter decoration using a cardboard egg carton and colorful plastic Easter eggs. The Bunny Basket Arts & Crafts Idea - This makes a wonderful Easter gift. The Nature Basket Arts & Crafts Idea for Kids - This is a beautiful Nature basket children can make for Easter. The Paper-Bag Easter Basket & Easter Bunny - Learn how to make this simple Easter basket bag with the following easy instructions. The Toy Basket - Any kid will love to receive this Easter basket. Tissue Box Easter Basket - Follow these instructions to turn a tissue box into an Easter basket. Twig Easter Basket Crafts Idea - Learn how to make an Easter basket from twigs and other materials. Woven Baskets from Wool - This is a fun weaving Easter project for kids. Woven Bunny Baskets Arts and Crafts Project Activity - Children can make their own Easter baskets with the help of a Bunny Basket Kit. Woven Easter Basket Arts and Crafts Project - Make a cute Easter basket from 25 yards of multicolor yarn, foamie weaver, scissors, craft foam and a low temp glue gun. Woven Easter Box Craft - Learn how to make a woven Easter box by following these instructions.